With SBI’s SparQ™ Cumate Switch System, you can get inducible gene expression in mammalian cells through the binding of cumate, a non-toxic small molecule, to CymR. 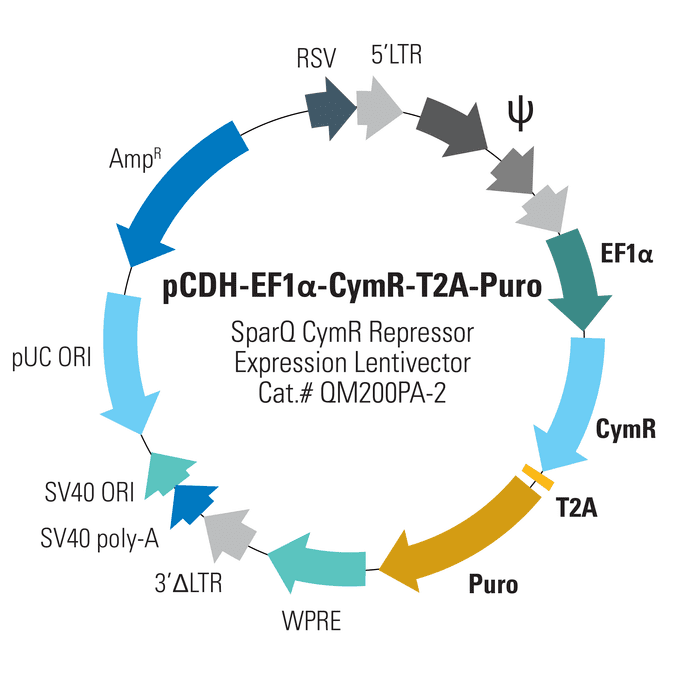 CymR can be delivered to cells on its own lentivector—such as with the pCDH-EF1α-CymR-T2A-Puro SparQ™ CymR Expression Vector (Cat.# QM200PA/VA-2)—or on the same lentivector as your gene-of-interest (Cat.#s QM800A-1 and QM812B-1). With the SparQ System, expression levels are tightly controlled and increase with increasing cumate concentration until maximum induction is reached—see as much as a 32-fold increase in gene expression. Even better, induction is reversible, so you can turn expression levels on and off. Delivering negligible background expression in the absence of cumate, the SparQ System is an excellent choice for achieving controlled levels of gene expression. The pCDH-EF1α-CymR-T2A-Puro Vector co-expresses CymR and a puromycin marker via the moderate EF1α promoter. Co-expression is mediated through a T2A element.